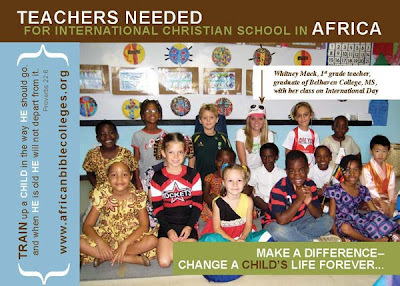 We are in need of teachers at the ABC Christian Academy. If you feel called to help for one year, or longer, or if you know a teacher who would be able to join us, please contact us and we will get the process rolling. Here is a link that tells more about the academy. If you have any questions about teaching in Malawi, please don’t hesitate to get in touch with us. Below is a postcard with some information. 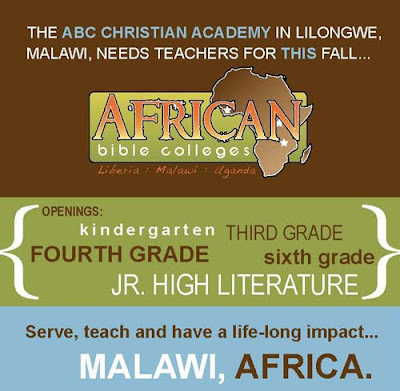 Below is a letter from the President of African Bible Colleges/Director of the Malawi campus. We are in need of a doctor or doctors to help out for the summer (winter in Malawi). If you feel called to help for three months, one year, or longer, or if you know a doctor or doctors who would be able to join us, please contact us and we will get you in touch with Paul. Here is a link to the brochure that tells more about the clinic. We look forward to hearing from you. “To all my Doctor friends, and friends who know doctors! We need help at our hospital this summer. We’re looking for Doctors to fill in for the months of June, July & August. Our clinic sees roughly 3, 000 patients a month - - most are seen by our three Malawian P.A.’s, but we also have two missionary physicians who see patients. Both are mothers who have kids enrolled at our academy and would like time off during the summer. If you know anyone who might be willing to come out for 3-6 weeks any time this summer it would help meet a huge need. We have housing available here on the ABC campus. We also make a vehicle available to visiting Doctors. Please let me know if you know anyone who may be interested. Here are a couple of videos of Amber Elizabeth and Molly Grace playing in the Hymn Festival at Frist Baptist Church in McComb, MS. We are so proud of them. They have only been taking piano for about four months. You will want to mute the music at the bottom of the page before playing the videos.